If you thought Steinberg just did Cubase, then think again. Yes, the company’s been in the software world for donkey’s years now, delivering the pristine DAW leader, but there’s also been a wealth of other titles including Nuendo, WaveLab and HALion. It has also delved into hardware in the past but more so in recent years, probably thanks to the hardware giant Yamaha’s involvement with the company (Yamaha bought Steinberg in 2005). We’ve been bigging up the company’s UR range of interfaces for a while now, the UR44 being a cracking studio and mobile interface. 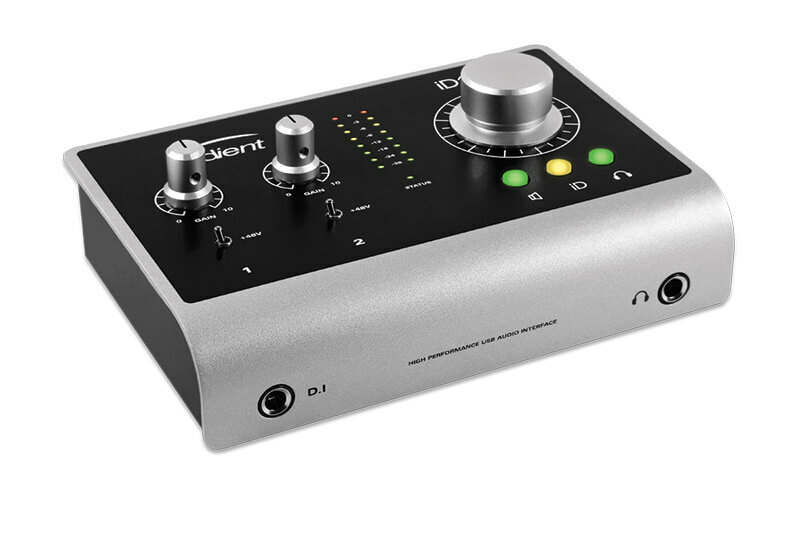 “The preamps are crystal clear and the build quality excellent. If your I/O needs are modest but you still want pro-level features, the UR44 is an excellent choice,” we said in our original review. However, that was a while ago, so no surprise that Steinberg announced two new interfaces earlier this year making up the all-new UR-RT range. However, these are a little different from the original UR range, featuring some Rupert Neve extras on the inputs. 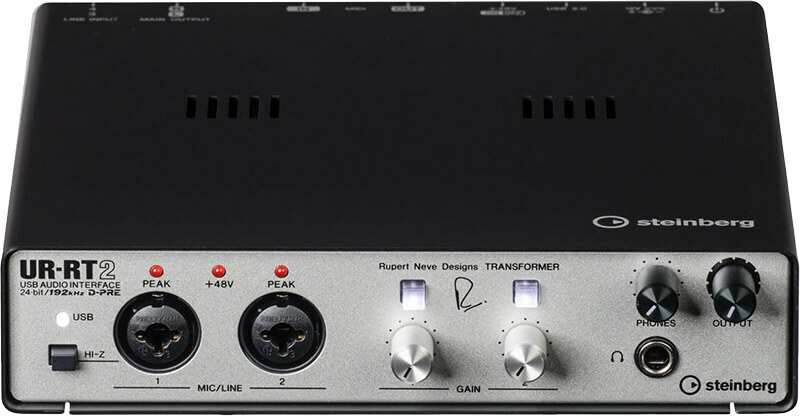 Should you wish, you can switch in Rupert Neve-designed transformers into the input recorded signal path to add a touch of ’wow’. The thinking is that these additions increase your recording options, so you can tailor a sound or add some pizazz to something perhaps a little limp. If you choose not to – you might want a very clean acoustic guitar, for example – you simply go for a wide and clean dynamic, courtesy of the Yamaha D-PRE preamps. So that’s Rupert Neve transformers, Yamaha preamps and a Steinberg badge. Still with us? Of course you are. This is either going to be one of the best interfaces around, or a case of too many cooks spoiling the audio broth. We’ve got the UR-RT2 in for our review and it’s a very solid product right from unboxing. It’s weighty, and certainly feels like there’s some transformer gubbins within it. It’s a USB 2.0 interface – probably still the most common around for audio – and there are four inputs and two outs. At the front you have a mic/instrument input and a mic/line input so mics, guitars and basses go in one and mics and line in the other. There are also two line level inputs around the back to make up the four inputs. Other connections include a switchable Hi-Z option for the first input and a +48v option at the back for both inputs, so you can choose to use either dynamic or condenser mics. Peak levels are shown with a single colour LED above each input. MIDI in and OUT sockets are around the back and a headphone out completes the connections at the front. Typical scenarios when using the UR-RT2 might be two singers plugged into the front of the unit with microphones with a separate keyboard around the back; or a singer-songwriter with a mic and guitar plugged into the front. You could even take the interface out and about and record three musicians with an iPad connected via (optional) camera connection kit, although the unit still requires power and is not bus-powered to use with a laptop. Final controls on the interface are the two switches above the Gain dials that allow you to bring the aforementioned Neve sound onto your inputs. All in all, it’s a very neat interface and a very neat idea, one that should really give you some versatile recording options, so let’s see how it performs in practice. 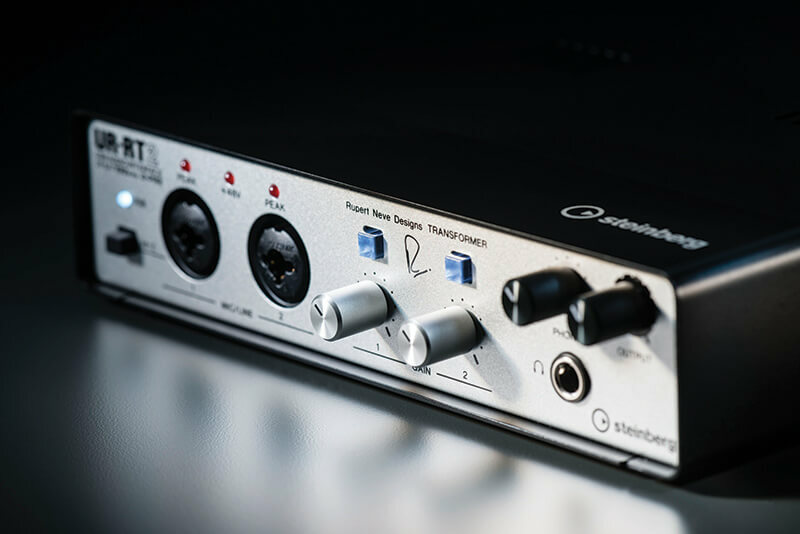 Do you need a rock solid – both in the physical and operation senses – audio interface? Well, you could do a lot worse. With the added flexibility of subtle Neve colouration, should you require it, you can apply the UR-RT2 to a greater variety of recording tasks as it will just lift a sound and, of course, you can tailor that sound with the on-board controls (not to mention with the supplied software as well). As ever with connecting newer interfaces Logic picked up the interface straight away and I was up and running very quickly. From the off I had latency figures starting at around 2.8ms one way to 5ms when increasing the buffer size to 128 samples. One annoyance was that putting my Mac to sleep would sometimes require a complete reboot of Logic for the two to reconnect, something I haven’t had to do with recent interfaces I’ve tested. Switching DAWs and setting it up with Cubase, I needed to nudge the software within the Studio Setup option so it would pick up the (already recognised) UR-RT2 and then everything was fine. The interface also comes with dspFXMix software for both iOS and desktop which gives you a zero latency monitoring option, plus a suite of effects. dspMixFx is essentially a channel strip that can sit between the interface and your DAW. It features EQ, compression and a rather nice reverb. You don’t need dspFXMix to run the interface with your DAW and I can see most desktop users just monitoring directly through whatever software they use, but it makes for a nice iOS app. Back to the hardware to look at its audio performance. First up I used the regular inputs on vocals (without the Neve transformers switched in). I got some excellent, low-noise results, and as crystal clear as they promised. I wasn’t getting too much difference when switching in the Neve transformers, though, it has to be said – some very subtle colouration at best. Recording some electric piano, I got a little more noise from the source and a little more colour courtesy of Neve, same with guitars but very subtle. The Neve sound itself is something that people do argue over, some saying that it’s a mild creamy colouration while others say that it adds a bold warmth in this terrible digital world of ours. I’d say it’s a lot more subtle than that – it does bring life where it’s needed but it’s not an effect, more a presence. Finally, I should touch on the fact that the UR-RT2 interface also comes Includes Cubase AI downloads for Mac and PC and Cubasis LE for iPad, both excellent, albeit cut down DAWs. You would expect this, of course, but it does prove that Steinberg really wants you to see this as an all-you-need solution for both desktop and iOS. After using the UR-RT2 for a variety of input recording tasks, you start to wonder why more companies don’t offer variable colour on their inputs. 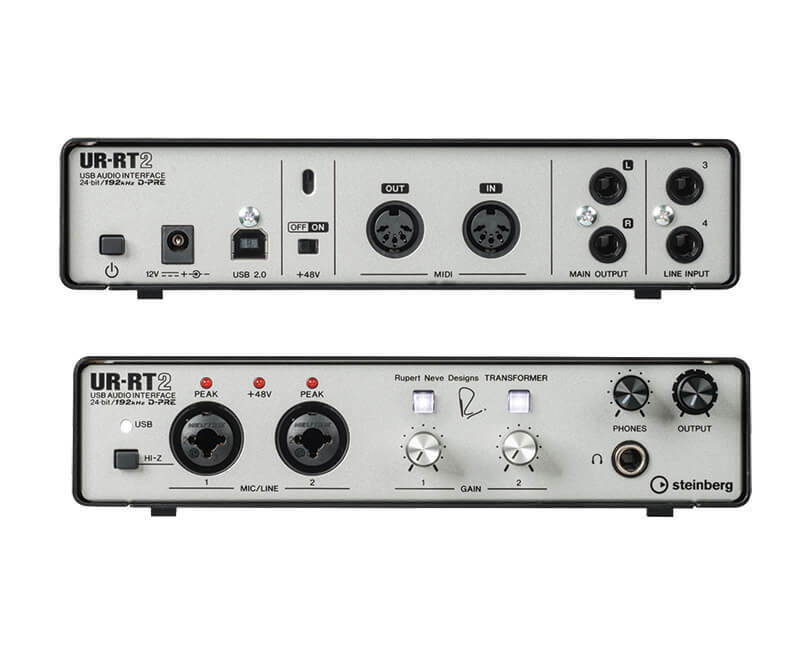 Sure you get dedicated channel strips and preamps to give you different flavours, but few offer both a pristine signal and a variable tone colouring in this way, and that’s what makes the UR-RT2 (and its older brother come to that) stand out. I guess one reason why more don’t do this is the price – the inclusion of the Neve circuitry means the UR-RT2 costs more than some interfaces with this number of ins and outs. It’s still the cheapest way to get that Neve sound though. Combine that with the flexibility of having a clean sound when you want it and some nice input/output combinations, and this an attractive unit for both studio and on the road. It’s rugged, and comes with two excellent DAWs for both so there’s really very little not to like. It’ll give you a clean sound when you want, or a Neve when you want – you decide. You could pick from a few Audients but I’ve chosen this as it has two Audient mic pres with a character all of their own but replaces the UR-R2’s other ins with eight ADAT ins. 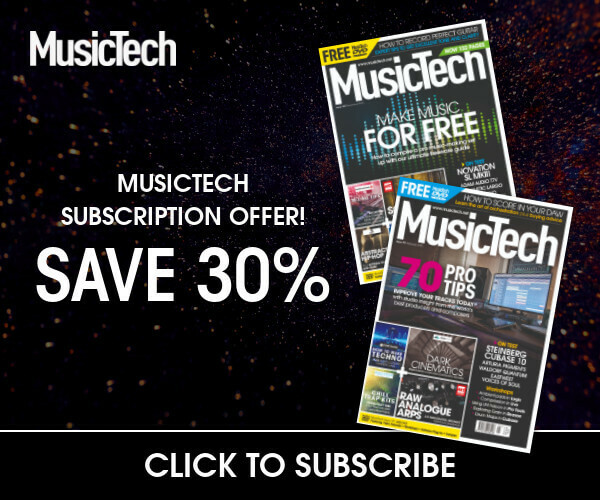 Look out for a review of the new iD44 in a forthcoming issue of MusicTech. 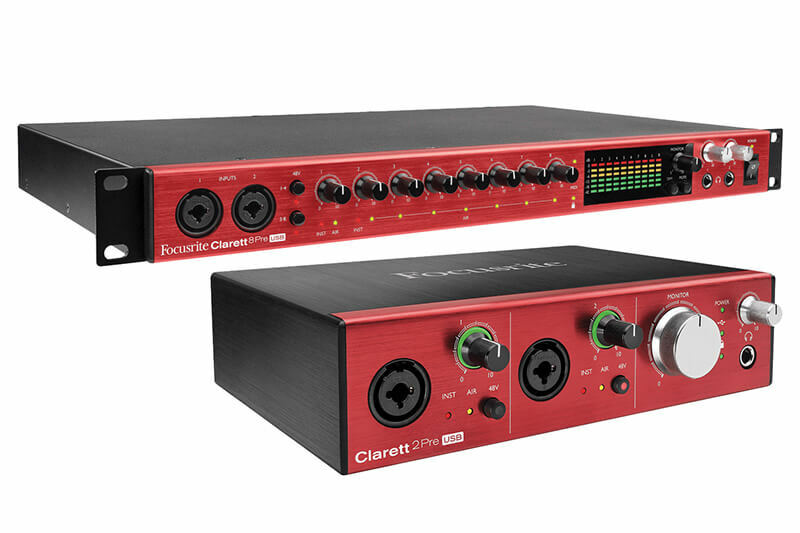 I’ve looked at quite a few of Focusrite’s Claretts and while no directly the same in terms of connectivity they do feature the added Air which in a Neve kind of way, adds a little something special when recording.